Launchey 1.4.4 – Set global hotkeys for launching your favorite apps. 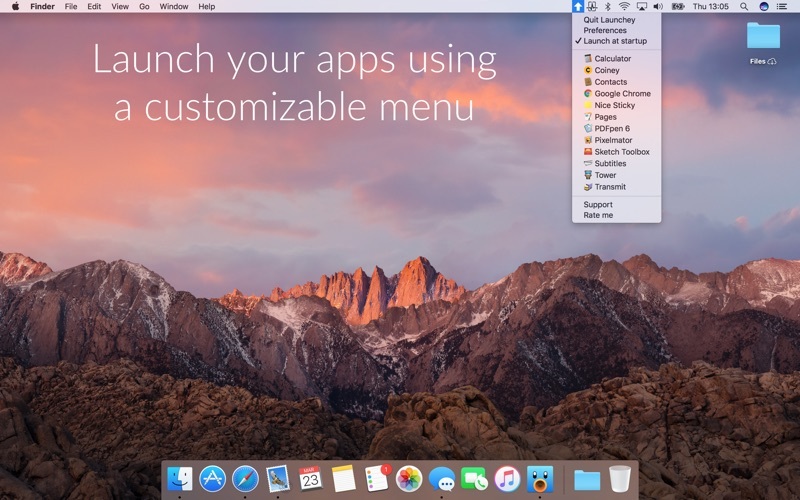 Launchey is a lightweight launcher that lets you launch any app on your Mac from the menubar. You can choose which apps are visible in the Launchey’s menubar menu and select up to 5 favorites that you can display on your directly on your Mac’s menubar. Launchey lets you set global hotkeys for launching your favorite apps. Next story Net Radar 1.1 – Monitor the status of your VPN connection. Previous story Super DVD Creator 6.1.33 – Burn Any Video to DVD. Command-Tab Plus 1.2 – Quick, convenient, keyboard-centric application switcher. Alfred 3.5.1 – Quick launcher for apps and more.